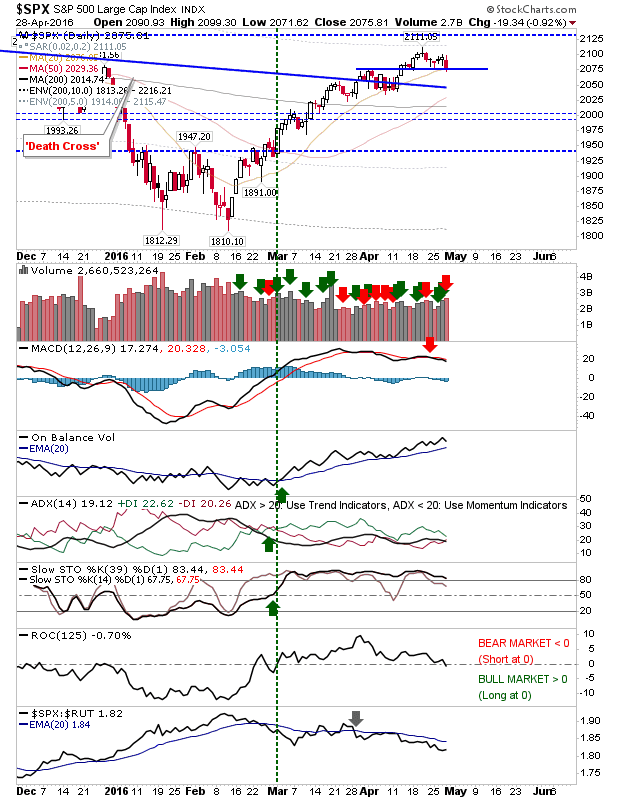 There was no escape for indices as sellers achieved the sweep across markets. The Semiconductor Index suffered a big reversal, but not enough to break the horizontal congestion in play since the end of March. And only clawed back some of the relative out-performance against indices such as the Nasdaq 100. Losses for the S&P were sub-$1 and didn't break nearest support. However, volume did rise to register as distribution. The Nasdaq took a more substantial hit - also on higher volume distribution - as it undercut the 200-day MA and headed toward its 50-day MA. 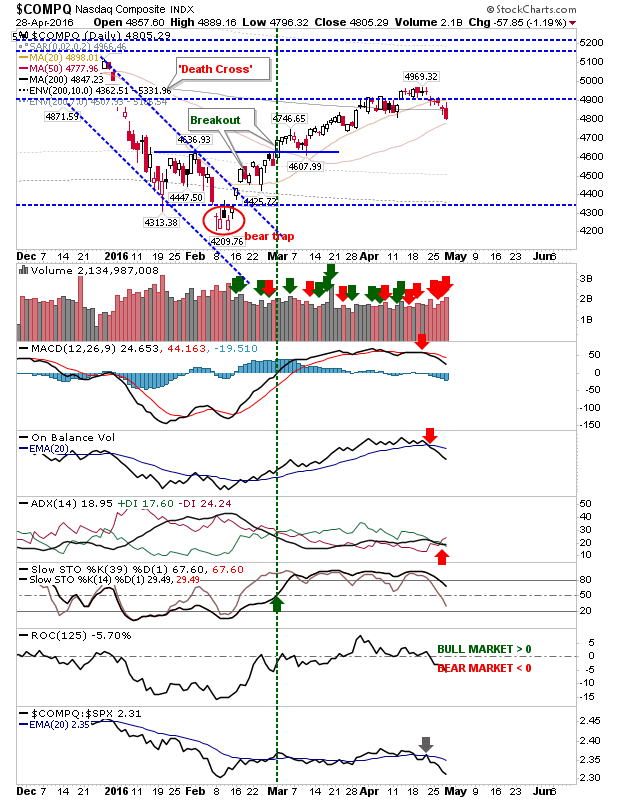 Technicals are bearish for the MACD, On-Balance-Volume and ADX (trend strength and direction). The index also delivered increased bearishness relative to the the S&P. The Russell 2000 didn't escape the selling either. Here, sellers pushed the index away from rising channel resistance as the 50-day MA sits on the verge of a bullish cross with the 200-day MA (a 'Golden Cross'). 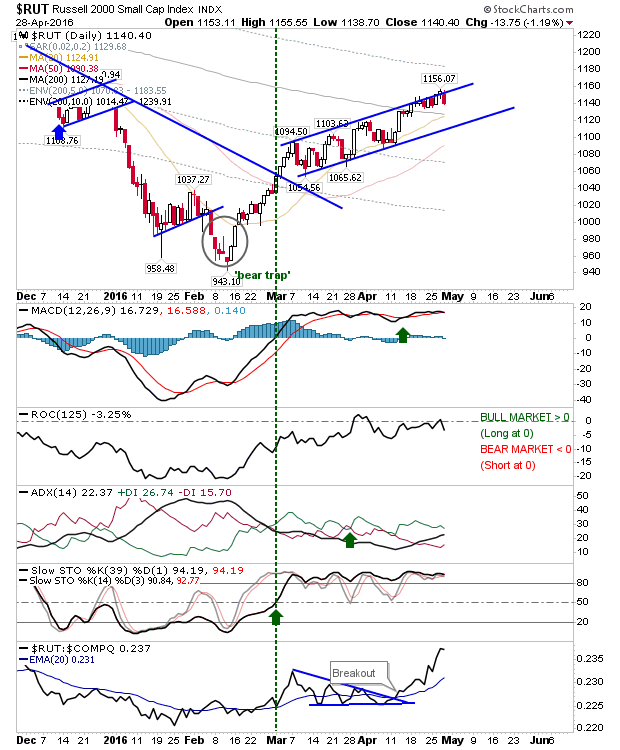 Other technicals - with the exception of ROC - remain more bullish than bearish. For tomorrow, watch for follow through downside. 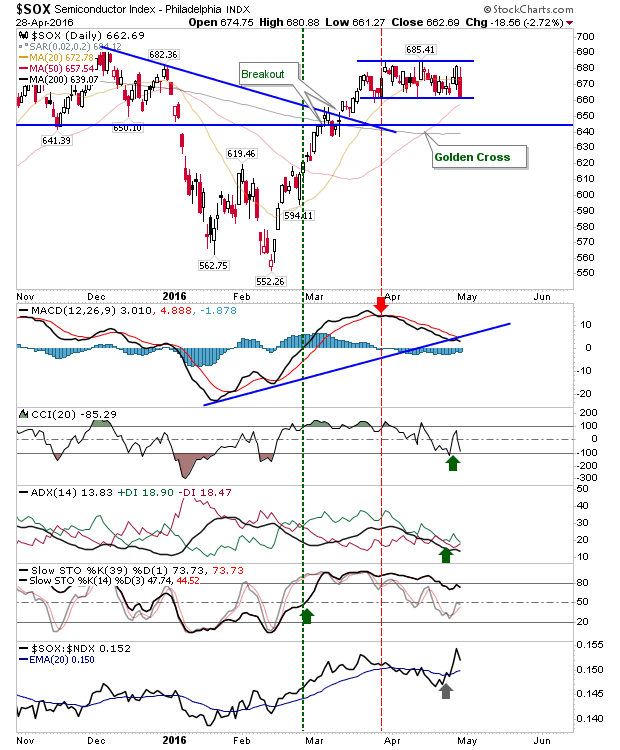 The Semiconductor Index had looked promising yesterday but is now on the vulnerable side. The Nasdaq posted its third day of distribution in a row and has erased all of its April gains. The S&P is still hanging on to its April breakout, but there isn't much room for maneuver. Bulls have had a good run of it, but bears will be looking to mount a proper challenge last seen at the start of the year.